Summer came early this year on the banks of the Baltic Sea and the second day of the Maxxis Grand Prix of Estonia took place, just like the first day in perfect conditions thanks to the remarkable organization of the entire RedMoto team! And like yesterday, it was the quartet of Eero REMES (SF-TM), Alex SALVINI (I-Husqvarna), Steve HOLCOMBE (GB-Beta), Brad FREEMAN (GB-Beta Boano) who animated the EnduroGP category with highs and lows. Showing remarkable pace at the start of the race, Eero REMES was unfortunately disappointed in the Enduro Test on the second lap where he broke his crankcase on a big stone. He was forced to retire, and the factory TM lost out big time in Tallinn, as his big championship rival Alex SALVINI won brilliantly on this second day. The rider from Bologna, SALVINI, showed his dominance and determination by taking the lead of the race at the halfway point. He managed and held on to a small advantage throughout the 11 tests of the day, despite the onslaught of FREEMAN (who continues to impress Enduro fans) and the speed of Steve HOLCOMBE who finished second by a little less than 10 seconds behind SALVINI. Only 8th after the first lap, Loic LARRIEU (F-Yamaha) recovered well afterwards to displace Christophe NAMBOTIN (F-Gas Gas) and take 4th. The two Frenchmen were ahead of the very consistent Danny MCCANNEY (GB-Gas Gas), and their compatriot Christophe CHARLIER (7th – Beta) who took his best result since the beginning of the season. Rather shaken by his heavy fall the day before, Jamie MCCANNEY (GB-Yamaha) could not do better than 8th. He precedes Thomas OLDRATI who placed his Honda 9th, while Antoine BASSET (F-Gas Gas) completed the Top 10 ahead of Basque rider Anthony GESLIN (F-Beta) who improves from GP to GP. But Alex SALVINI was undoubtedly the big winner of this Estonian Grand Prix as he definitively confirms his return to the forefront and is leading the championship at the season’s mid-point. Steve HOLCOMBE will have to work hard for the remaining 4 Grand Prix if he wants to keep his Number 1 crown. SALVINI made a double blow with a clear victory in Enduro 2 where he beat Loic LARRIEU and Corsican Christophe CHARLIER who finally took his first podium of 2018. Brad FREEMAN was untouchable in E1 and thus takes the lead of the championship in this category in front of Jamie MCCANNEY who will also push hard at the next event as FREEMAN is on the rise. Antoine BASSET secured another podium in E1, even thought he had to hold off Alex SNOW at the start of the day. 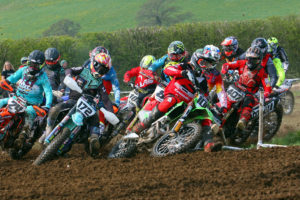 Steve HOLCOMBE had no opponent to match him in Enduro 3 despite the “awakening” on Sunday of Christophe NAMBOTIN, and the superb performance of Danny MCCANNEY. In the Juniors it was Matteo CAVALLO (I-Beta Boano) who was the fastest all day long and he won this second day of racing by a clear margin against his compatriot Davide SORECA (I-TM) and yesterday’s overall winner, Theo ESPINASSE (F-Sherco) who confirmed his form with a very good third place. Matteo CAVALLO, in the manner of Alex SALVINI, confirms after 4 Grand Prix that he is the man to beat in the Under 23 classes, in a season that seems to have seen the resurgence of Italy as powerhouse in World Enduro. Matteo CAVALLO also made a double win in Junior 2, winning in front of SORECA and Jack EDMONDSON (GB-Sherco). David ABGRALL (F-Sherco Academy) and Tosha SCHAREINA (E-KTM) completed the Top 5 in this class. While in the Youth 125cc class Finland’s Roni KYTONEN (SF-Husqvarna) and Spaniard Gerard GOMEZ (KTM) were the early leaders on Day 2, but they soon had to relinquish the lead to Chilean Ruy BARBOSA (Husqvarna). Although the ‘favourite’ and current leader in this category, BARBOSA had to fight until the last special to hold onto a gap of 6 seconds ahead of New Zealand newcomer Hamish MCDONALD (Sherco) who took a great reward for his promising talent. The “Kiwi” is part of the young generation of riders who are blooming in EnduroGP and who impress us at each Grand Prix, like MUNDELL (GB-Sherco) or VAN OEVELEN (B-Sherco) who were 4th and 5th respectively today. Already at the mid-point, next stop: THE Wall! The milestone of the mid-season has been reached with this superb Maxxis Grand Prix of Estonia… the next stop of 2018 will be on June 29 and 30 in Pietramurata (Italy) for the famous event “The Wall”, which will see traditional Enduro flirt with a “Hard Enduro” type event. This will be a major and innovative meeting where Alex SALVINI and Matteo CAVALLO will be the big favourites to experience the greatest joy of all – winning in front of the thousands of ‘Tifosi’ expected in the region of Trento!